T Fal or Tefal is a very popular brand for kitchen ware. They are well known for making innovative products that are ideal for modern cooking styles. A good example of their expertise in cook ware is the Tefal pressure cooker. This is a scientifically designed product that helps cook food a lot quicker while retaining maximum nutrients. This is exactly what a modern cook needs. There are three popular models from Tefal. Each has a unique design but comes with the same Tefal quality and trust. They are the Clipso Control +, Clipso Modulo and NutriCook. This is probably the most innovatively designed cooker for the modern homes. It comes with a foldable handle. This means that you can folder it into a compact size to stowing in your kitchen racks and when it comes to cooking, you can open the handle for easier manoeuvring and handing. It is not just the handle, but even the lid can be turned upside down while store so the cooker actually becomes quite compact in your racks. It is not just about space management, Clipso control plus also has a one hand locking system, so you can actually lock the cooker easily with a single hand too. The timer on the cooker ensures that you can keep track of when the cooking starts. It is removable so you need not have it on all the time too. It comes with two programmable settings. The vitamins/ meat and the fish; each setting designed to ensure maximum retention of nutrients in that category of food. This model is a scaled down version of Clipso Control +. This one does not have the fancy accessories like the timer and colour handles, however from the main feature point of view it is as good as any other cooker. It comes with safety features like pressure regulator valve, secured opening and closing and over pressure protection. Like the Control + this is also available in capacities ranging from 4.5 litres to 10 litres. This unit is made from stainless steel and comes with a shiny finish. This means that it can be cleaned very easily and it is dish washer safe too. This is the third and one of the mode advanced models from Tefal. 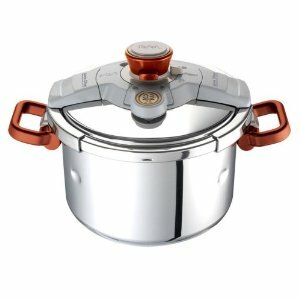 This tefal pressure cooker comes with five distinct cooking modes for handling all kinds of foods. In the vegetable mode, you can retain nearly 100% more vitamin C than traditional cooking techniques. Besides there are modes that ensure that fish retains up to 25% more Omega 3, carbohydrates get absorbed slowly while meat get cooked a lot faster while retaining the same level of Vitamin B6. 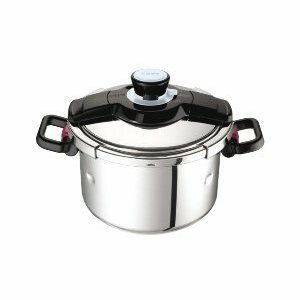 Tefal is part of the SEB pressure cooker which market in Europe.